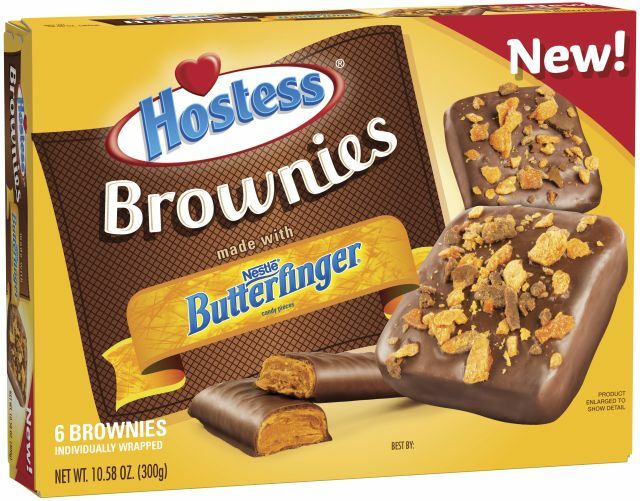 Hostess expands their brownie selection with the launch of new Hostess Brownies made with Butterfinger. Created in partnership with Nestle, the new packaged dessert features a chocolate brownie covered in fudge and topped with Butterfinger pieces. The candy-topped brownie follows in the footsteps of Hostess Brownies with M&M's and Hostess Brownies with Milky Way, which were first introduced last year. You can find the brownies on store shelves nationwide in both single-serve packs and multi-packs with a suggested price of $1.89 and $3.99, respectively. Photo via Hostess Brands, LLP.